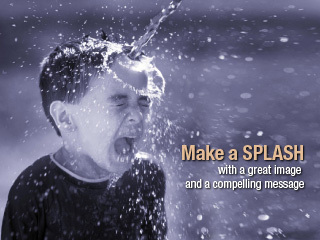 Soupbone Creative provides advertising, brand development, graphic design, marketing, multimedia, SEO and web site design in Blacksburg, New River Valley, and Roanoke, Virginia. Soupbone Creative's graphic designer and website designer will help you develop and implement strategic marketing solutions across a variety of communications media with personalized service, innovative graphic design and search engine optimization for your website design, and branding strategies for print marketing and multimedia design in Blacksburg, Christiansburg, Salem, Roanoke, Radford, Floyd, Dublin, and Charlottesville, Virginia. Browse this site for samples of my work. >> Email or call 540-230-9433 to discuss your project. 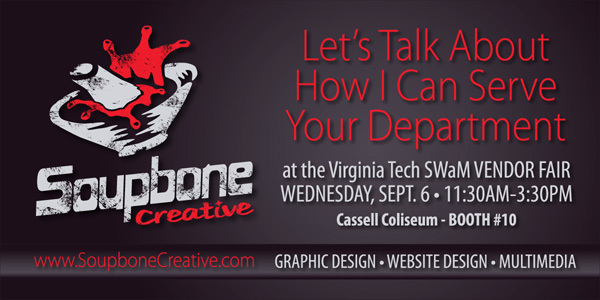 Visit our booth #10 at the Virginia Tech SWaM Vendor Fair on Wed., Sept. 6 from 11:30 a.m.-3:30p.m. Click on an image below to jump to key pages in the portfolio tour. Serving clients in the NRV, Blacksburg, Christiansburg, Salem, Roanoke, Dublin, Radford, Lynchburg, Charlottesville, Virginia.